This website by J. Kent Holland, principal of ConstructionRisk, LLC, is published as a free construction risk management resource. The top menu bar includes drop down menus with numerous articles, papers, and continuing education materials. The sidebar provides a Search box to research legal and risk management topics that have been discussed in our ConstructionRisk.com Report since 1999. The Topics covered include professional liability, indemnification clauses, duty to defend, standard of care, warranties, construction defects, site safety, payment provisions, design-build, construction management (CM) contracts, litigation lessons learned, and much more. Extreme weather events, such as hurricanes and excessive rains causing severe flooding, seem to be increasingly in the news and on the public’s mind. This briefing addresses the legal and ethical responsibilities that design professionals must consider with respect to climate volatility when designing projects. Is resiliency such an important obligation that a design professional must design for it based on current science – and the evidence and facts at hand – even if the law, regulations and government agencies do not require it? This paper concludes that complying with code may not be sufficient and that designers may have an enhanced standard of care to design against the extreme weather events that are increasingly foreseeable. Read article. 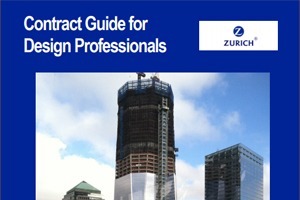 For a comparison of what I believe are important changes between the 2007 and 2017 AIA A201 and B101 documents, read my Construction & Design Risk Briefing (Winter 2017) edition, Comparison of 2007 and 2017 AIA contract documents, published by Zurich Insurance. You may also view the course videos on our Construction Risk Management YouTube video channel. See example videos directly below. Discussion of the following contract clauses: Advertising, Americans with Disabilities Act, As-Built Drawings, Certifications, Compliance with Law, and Changes in Services. View the entire course here. All the Videos are hosted on YouTube. If they do not open when you click on them, it may be because your office blocks access.